Displays the Level, Health Points, and Magic Points as well as gauges for Health, Magic, and Experience for you and your mercenaries. You can select a character by using the number keys 1-9 on the keyboard. Character Info Page give detailed information on a specific characters attributes. Displays character name, level, and current mercenaries in your party out of total possible. Displays the character's stats; Strength, Intelligence, Dexterity, and Vitality. Also, displays character's Attack Power, Defense, Magic Defense, and Critital Rating. Stats can be increased by acquiring and using "Growth Vials" and will consume 1 Bonus Point each time. Displays current level, Total Experience / Required for Next Level, Health Points, Magic Points, and Might. Bonus Points: 1 Bonus Point is required each time a "Growth Vial" is used to increase stats. 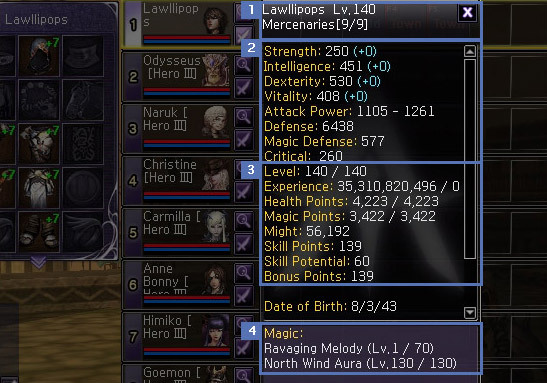 Character's currently known magic skills and the current level of each skill. 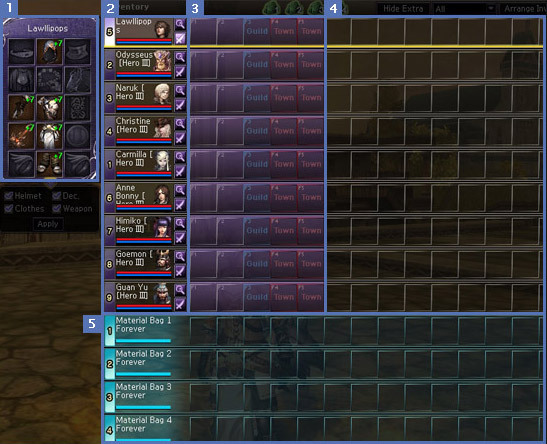 Equipment Window - Display all items that a character or mercenary currently has equipped. List of current character and hired mercenaries. You can place consumable items in Quick Slots for easy use with F1-F5. Depending on the item placed in the Quick Slots, you can use Quick Slowts in and out of battle. You cannot use food during battle. If your Guild doesn't own a town, but part of a Nation, the two Town Slots will be unlocked. Inventory - Each character and mercenary gets their own inventory space and whenever an item is acquire it will be placed in the inventory. 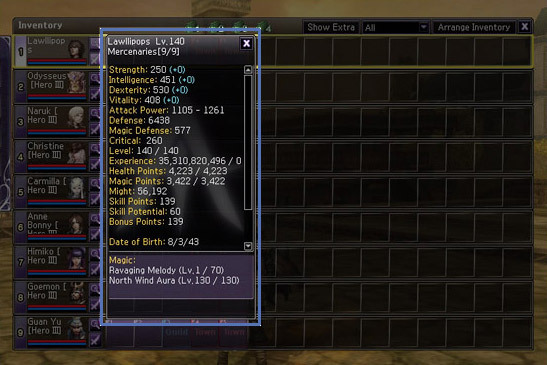 This section of the inventory only appears if the user uses an "Extra Inventory License". This space offers more room to hold items and is reserved for the use of boxes and other materials. Quest items and equipment cannot be stored in these spaces. 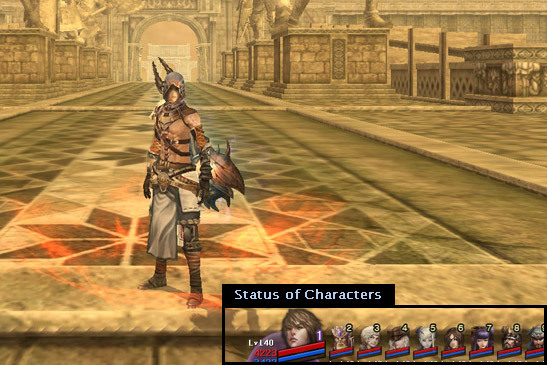 Will - Will is require for many actions in Atlantica such as consuming food, sharing knowledge, and teleporting. This meter fills up automatically with time. Displays active effects that will eventually expire, such as Blessing License. Mini Map - Displays current coordinates and the location of your character, party members, and NPCs. Zoom In/Zoom Out - Used to adjust the zoom level of the Mini Map. 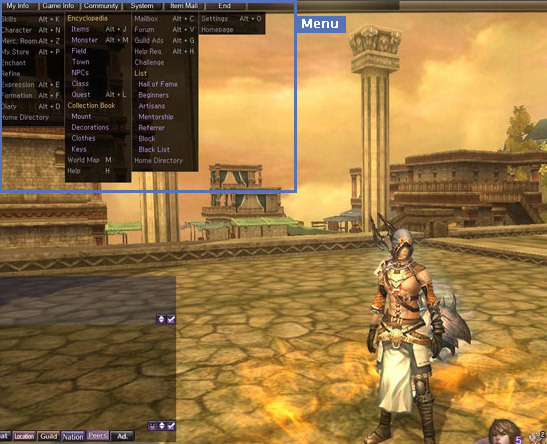 My Info - Character functions such as Skills, Mercenary Storage Room, Enchanting, and Battle Formation. Game Info - General game information as well as information you've acquired during your adventures. Community - Community related functions to help interact with other players, including Mailbox, Party Request, and Help Requests. 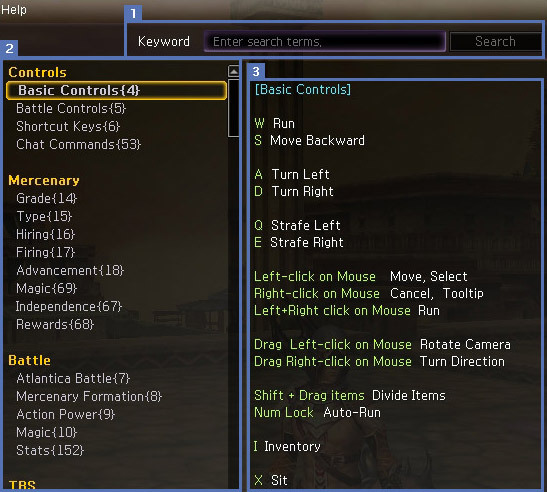 System - Function for changing game settings and accessing the Atlantica homepage. After entering in Keyword(s) click the 'Search' button to search through the available Help Topics. 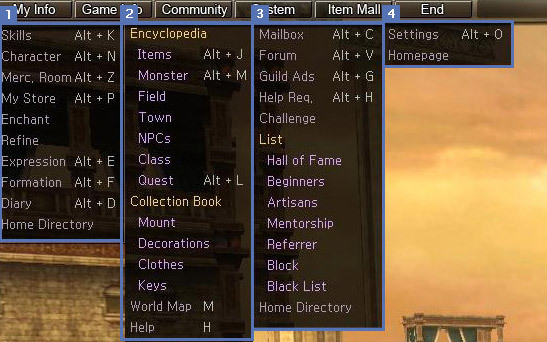 This panel displays an index of the currently available Help Topics in the game. Displays the detailed entry of the Help Topic which is selected in the Help Topic Index panel.